It was 8:00pm on a Saturday night, and Adams Morgan was just beginning to stir. Bartenders along 18th street cleaned their tap lines and took their places as the night’s early birds trickled in. Mr. Green Bean and I met up with Weg-Man and Wife at Mintwood Place, a more mature establishment tucked away on the quieter Columbia Road. By the time we finished dinner, the streets were flooded with short skirts, tight jeans, and jumbo slices. We walked back to Cleveland Park grateful for our jumbo stomachs filled with top quality cuisine. We started the meal in typical fashion when dining with Weg-Man and Wife—cheese plate and cocktails. 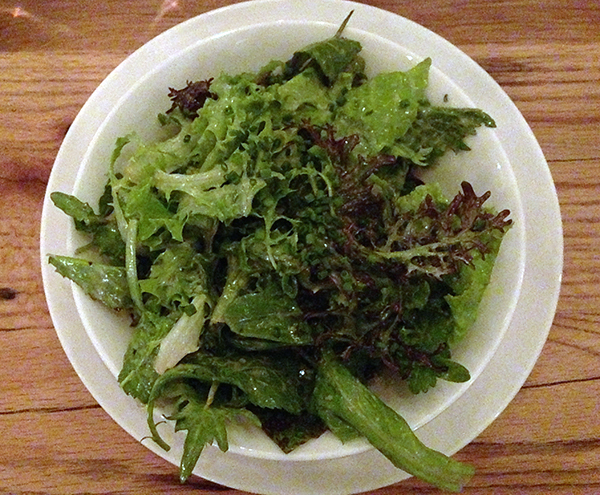 Mr. Green bean and I shared a simple mixed green salad with a zesty mustard vinaigrette. We nibbled and sipped and placed our entree orders after the server and I dissected the menu together. I decided on the skate wing with caponata and socca. It was that last component that grabbed me. These chickpea pancakes are a new favorite in our apartment. I have been frying them to Mr. Green Bean’s delight as a side to hearty stews or a “crust” for Sunday morning frittatas. 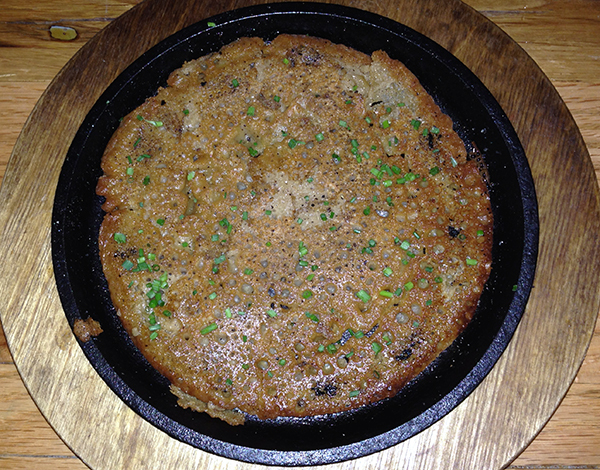 The server assured me the night’s skate dish, including the socca, was gluten-free. He should have assured the chef. 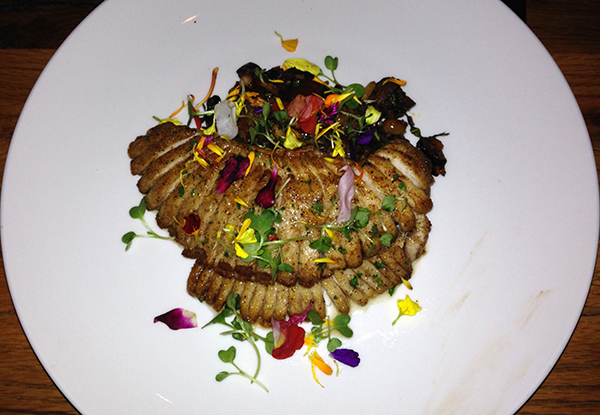 When my plate arrived, adorned with a colorful sprinkling of edible flowers, I searched high and low for that socca. The beautifully fanned skate wing looked a little flat, and the caponata appeared runny. I pointed out this oddity to our server who left the table confused. He quickly returned with a steaming hot garbonza flatbread, again confirmed to be gluten-free. It seemed a misunderstanding was to blame, though I am left slightly baffled. In any case, the skate wing was light and flaky and the eggplant salty and smoky. The socca? Amazing: rich, nutty and just thick enough to soak up the caponata juice. Weg-Wife offered me a bite of her gluten-free, cast-iron, wood-oven roasted chicken, which was moist and flavorful, a different creature entirely from the one that regularly exits my oven either burnt or dry. Our side of broccolini with balsamic and hazelnuts offered a salty crunch, though was overshadowed by our generously portioned entrees. Dinners with Weg-man and Wife end as predictably as they begin given Weg-Wife’s tremendous sweet tooth. 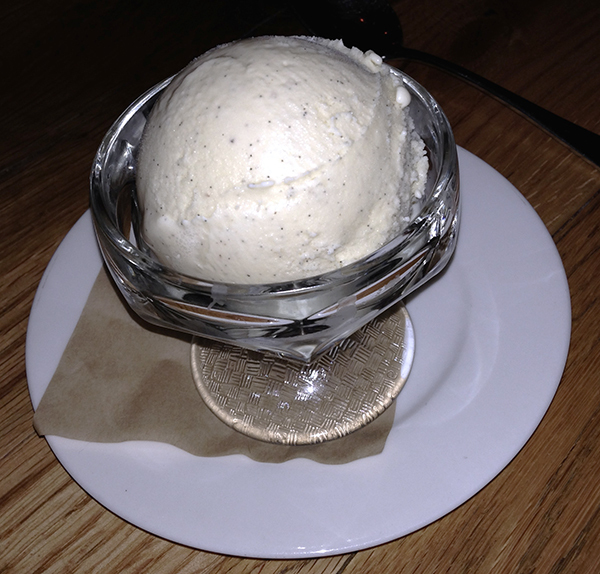 Spoonfulls of house-made French vanilla gelato balanced out the sodium-filled meal. Our digestive systems thanked us for the leisurely stroll home. Mr. Green Bean and I said goodbye to Weg-man and Wife by the zoo and continued on to Cleveland Park. As we approached the strip, our intentions of making it an early evening quickly turned into a night cap at Ripple followed by a competitive round of pool at Atomic Billiards. So take that, young’uns of Adams Morgan. We still got it! I could not have been happier when my head hit the pillow much later that night. Categories: American, Comfort, Dessert, Dinner, French, Gluten-Free, Seafood, Washington DC | Permalink.